[S52] 1850 Census;, Pittsburg Ward 1. [S548] Margaret V. Woodrough, 2000-, This reference was found in 1984 in vol. 26 of something (I didn't make note of what). See very back of my Green notebook. She may have had a daughter named Catherine as a "Ms Kate McCalley" was bridesmaid at wedding of Lavinia Blakely and Sebastian Wimmer in 1857. [S630] John Smith unknown record type, by unknown photographer. Biography* 1791� Described as a "learned Scotch-Irishman, who had a classical education and was at one time a professor in the College at Sheffield, England". A family story says that "One of his ancestors, having been disposessed of his estate by Cromwell, learned the trade of a blacksmith and after the battle of Culloden shod Price Charlie's horse with the shoes backward and thus contributed to his escape." "Mr. Smythe came to America about 1791, and was very particular that his name be spelled Smythe and not Smith." I've searched rather extensively to determine why and how John Smyth arrived in Murrinsville Pennsylvania. the only record of him is in the "History of St. Aplhonsus Church Murrinsville" by John L. Canova. St. Alphonsus was not founded until 1841 but it houses records from much earlier. John and his wife Margaret are called Schmidt in the records but I am sure it is the right couple. 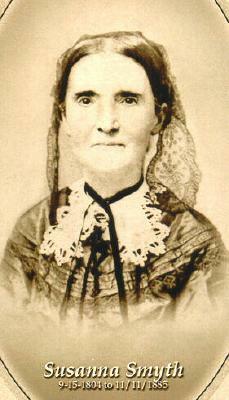 They were witness at the baptism of a baby named McCalley and their own child's (Katherine) baptism was recorded. There were three communities within the area, Saint Patrick's at Sugar Creek in Armstrong County and Sportsman Hall in Westmoreland seem to have actual buildings. The other group was housed at John Murrin's home and they drew from Murrinsille as well as Slippery Rock. A priest would visit periodically - riding the circuit. The Ruffners were deeply involved in the founding of Sportsman Hall and John Smith was listed as a contributor near Slippery Rock. Living* circa 1815� He was living circa 1815; "Having received an honorable discharge, he left the city of Buffalo for New Orleans to visit his parents, going by way of Erie, thence to Meadeville and down the Allegheny river in a barge, paying his passage by helping run the boat. All was then new and wild in this region. He was delayed in Pittsburg and met his future wife. He later returned to marry her." Since the couple was married in 1816 this note suggest that the John Smyth family lived in Pittsburgh starting about 1813-1814. This squares nicely with stories that say his daughter Susanna lived in Murrinsville, Pennsylvania until she was age 10 (she was born in 1804). Now the question is why did he go to Pittsburgh? Note 1833� In 1833 He might have had brothers (or sons) named Jacob and David as they were listed as subscribers to Sportsmans Hall in 1833. I only have Volumes 1-5, so John Smyth is not in my books. Subject: Washington County - Look up request Would you be so kind as to look up the following two wills for me? Edward Smyth Vol 5 page 130 (1834) and John Smyth Vol 6 page 537 (1847) Many many thanks. 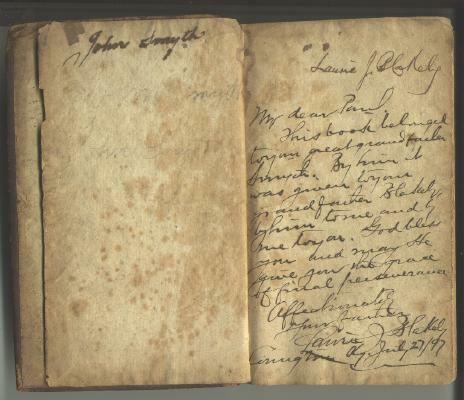 Note* 1897� He In 1998 during the clean out of Beechwood's attic a book was found with the following inscription: On the upper left of the fly leaf was the name John Smyth. On the opposing right fly leaf was the following: Laurie J. Blakely My dear Paul (Paul Lendrum Blakely) This book belonged to your great grandfather Smyth. By him it was given to our grandfather Blakely (James), by him to me and by me to you. God bless you and may he give you the grace of final perserverance. Affectionately your father Laurie J. Blakely Covington, Ky July 27 1897. In 2000 the book is in the keeping of Margot Woodrough and is in the Blakely archives. in 1897. Delightful, pleasant weather; not cold at all and thawing about noon. Called at Luhr's store about 9 a.m., thence took 2nd breakfast at Mr. Eldridge's at 9½ a.m. Wrote Power of Attorney of Susanna Blakely (daughter of deceased Anna Margeretta Smyth, who was daughter of Simon Ruffner of Westmoreland Co., Pa.) to Sebastian Wimmer to enable me to draw some inheritance money. Sebastian Wimmer Diary. Birth* 1795� DAR papers 91652.
ones for a little while longer, she was bravely cheerful from first to last. The purity and holiness of her life and character, are beyond expression, and her influence will ever be a beacon light to those who knew and loved her. She always had a gentle word and smile for one and all. When suffering most her submission to the will of God became but the greater. She was sustained by His hand which was waiting to help her over the dark river into the glory of eternal rest. When Death claimed her He left her sweetly fair, she seemed “not dead but sleeping.” The lifeless form lay in its ethereal and solemn loveliness. Her hands folded on her breast, her eyes closed as though in dreamless slumber, having no sign of the Destroyer’s hand, save in the hue that blanched the lips, on which a smile of holy calm lingered and a voiceless prayer hung suspended. The funeral took place on Monday last at 9 o’clock A,M. from the German Catholic church. A large concourse of friends followed the remains. The solemn Requiem Mass was chanted by her son, Rev. She was sometimes called Susan. [S54] 1860 Census;, LDS # 805,059 6th Ward Allegheny Co., Pittsburgh. [S55] 1870 Census;, Occupation for James shown as "Fire Insurance Agent." Sally and Warren Hart took Minnie and Willie. However, there is no sign of either Minnie or Willie in the hart household in 1900. Rueben and Willie Ann took Nancy and Pink. After Ruben raped Nancy Pink was sent to live with Warren and Sally Hart. Mary Ann Davis and George Meyer took George. [S111] Unknown subject unknown repository. [S110] Unknown subject unknown repository.